The release of this PokerStars Poker app via Apple’s iTune App Store makes it possible for users of iPhone and iPad devices running on iOS Versions 6 and up, to take their real money poker playing engagement anywhere, 24/7. Available as a free-to-download app, it allows compatible iOS device users to sign up as new members and join other players instantly, and even receive free playing money worth $20, after placing an initial deposit. When depositing money for the first time, the app carries on with all the necessary verification procedures by asking the depositing player to fill up the Advanced Profile Form. Through their mobile device, the new PokerStars members can deposit real money in their game account, to place as bets or for paying tournament buy -in fees. The app instantly furnishes a slider shortcut for viewing different PokerStars games and tournaments to access. You can simply swipe to the left to view the available choices: Sit & Go, Cash Games, Ring Games, Zoom, and Spin & Go. Define the game you wish to join in by tapping on the Info (i) Button, so you can filter your search according to game type, buy-in fee, speed (regular, turbo or hyper), number of tournaments available, including number of entrants allowed and already registered. Tapping on the Play Now button brings you directly to a poker room where you can find or pick a table in which you can join. The app indicates if a seat is open, but you have to first check out what it says about the minimum chips required for the game and the maximum chip for each table. If you wish to proceed but need to add additional funds, you can tap the “Open Seat,” while the app will give you direct access to the mobile cashiering section. In the meantime, the Open Seat will be marked with your account name and a “Sitting Out” notice indicated, until you have deposited the funds you need. If you wish to view other tables for other types of poker games, take note of the Plus (+) button at the top, as you can use this to check out more tables based on your pre-selected game preferences. Navigate your way through the virtual poker room by tapping on the green buttons. Once you are in, the app makes it easy for you to grasp the game currently ongoing. Reading on the Dealer messages below will let you know who is winning on the current game. The dealer also pokes players when their turn is up, and lets them know of the time remaining with which to take action; whether to bet, check, raise, call, go all in, or fold. 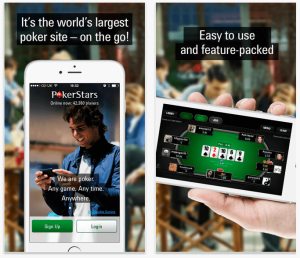 For the benefit of iOS mobile players who will be trying out PokerStars Texas Hold’em games for the first time, this real-money gambling app provides a direct link to the website’s video tutorials and to PokerStars’ Poker School Online. Newbies and those aspiring to become poker pros can enroll free of charge, in order to learn not only the basics of poker but also about varying playing styles, tips for bankroll management, and for developing advanced playing techniques as well. In addition, newbies or those still wishing to master their poker-playing skills can do so by playing with the free-to-play Texas Hold’em and Omaha games that mirror the actual games played for real money. Initially, the PokerStars app furnishes a starting stack of 1000 chips, and replenishes with another free 1,000 chips upon request.